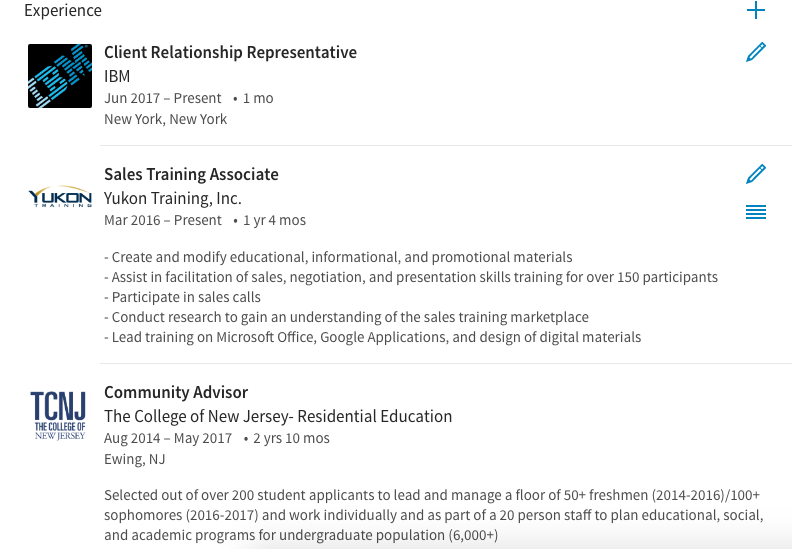 When I was a sophomore in college I led a program about how to make the most of your LinkedIn profile and realized that few college students understand the massive benefits of the site. 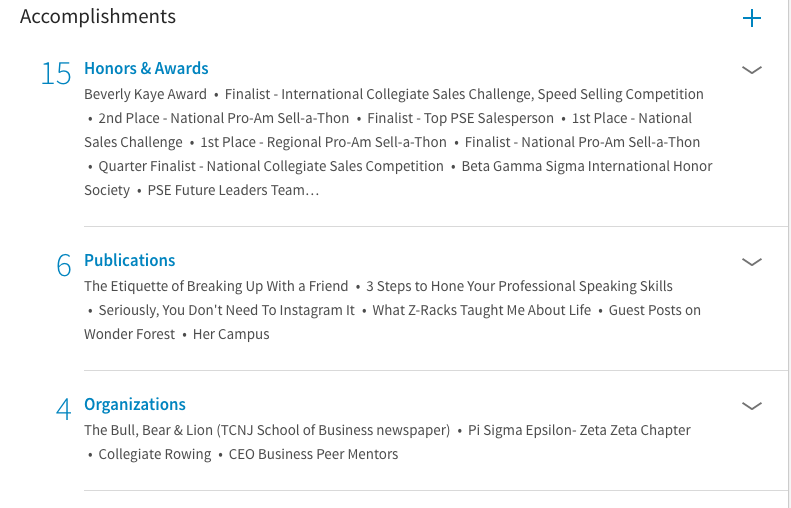 LinkedIn is the "professional" social site that allows you to build a profile that highlights your experience and skills, connect with others, publish articles, share updates, and stay on top of what is going on in your industry. I've decided to do a series about how to maximize your LinkedIn profile and use it to get a job or internship, build up your professional brand, and stay connected with others. Today we're going to go over the basics of creating an optimal profile and I'll share some lesser known secrets of a true LinkedIn All-Star (which is not my own made up title, but actually the "level" I have achieved on LinkedIn haha Clearly, I really like to use this site). 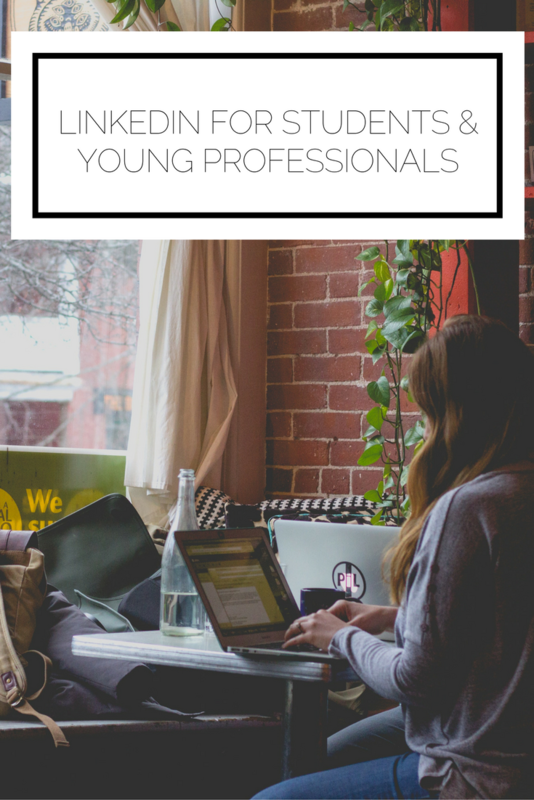 I cannot stress the importance of having a professional online brand enough, no matter what your major or industry! Employers will Google you, and you want the first thing to come up to be your LinkedIn rather than your Facebook, right? Right. When you intentionally craft a profile that highlights your unique skills, you make yourself that much more employable. 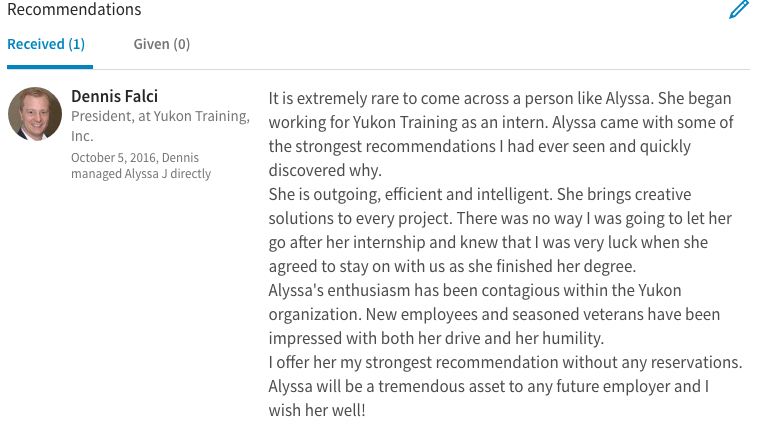 Additionally, LinkedIn is an amazing way to stay connected to others and know about how they are progressing in their career. You can be reminded when someone has a work anniversary and say congratulations and can help them out when they are looking for new career opportunities. Plus, JOBS! LinkedIn is a major tool for recruiters to find candidates so you better bet your chances improve by being on the site. Anyone who has been on this blog before knows that I like to begin with the end in mind and have a clear goal we are working towards. With LinkedIn it is important to know what you are looking to achieve. Do you want to find a new job? Make new connections? Use your profile as an extension of your online brand? Keep this in mind as you fill out the specifics of your profile so that you can gear it towards what you are hoping to get out of it. If you're starting from scratch, you will need to go to LinkedIn and register for an account. Use an email that you are confident you will continue to have (i.e. your personal versus work email) so you don't have to deal with switching over if you change jobs. For your profile photo, you will want a professional image of you alone. Don't choose a photo that obviously cropped someone out or of you wearing anything you wouldn't go on an interview in. For your background photo, you can choose something that represents your industry or (like me) your location. You can stick with the stock image provided, but having it more personalized is a good way to show that you are an active LinkedIn user. The next section can be thought of as "you at a glance." For your headline you can put a tagline of sorts. Some people like to put what they do (ex: passionate about helping businesses solve complex problems through data analytics) or you can go more simple like me, putting the company I work for and my love of blogging. The other elements listed above a pretty self-explanatory. This is open to those who are connected with you so they know how to get in touch. You can add whatever ways you feel comfortable sharing (for example, I don't include my phone number). Oh, the summary. This is your space to give a quick explanation of what you do, what skills you have to bring the table, and how you are looking to progress. Your summary will change as you move through your education and career (and honestly, mine doesn't quite follow what I just said above because I am starting out a new role and haven't solidified exactly what I want to convey just yet haha). You can let your personality shine through here. My best advice is to keep it short (three paragraphs, max) and to make it clear what your call to action is for anyone viewing your profile. Do you want to connect with people in a particular industry? Find out about post-grad opportunities? Let it be known here. This is like your extended resume. You can enter where you have worked, for how long, and what you did. You can even include media (like a website you created or a video you made) pertaining to your role. Just like your resume, use action words, bullet points, and numbers to make it clear what you accomplished. Within education you can include what you studied, your GPA, and any other notable elements that aren't included in another section. 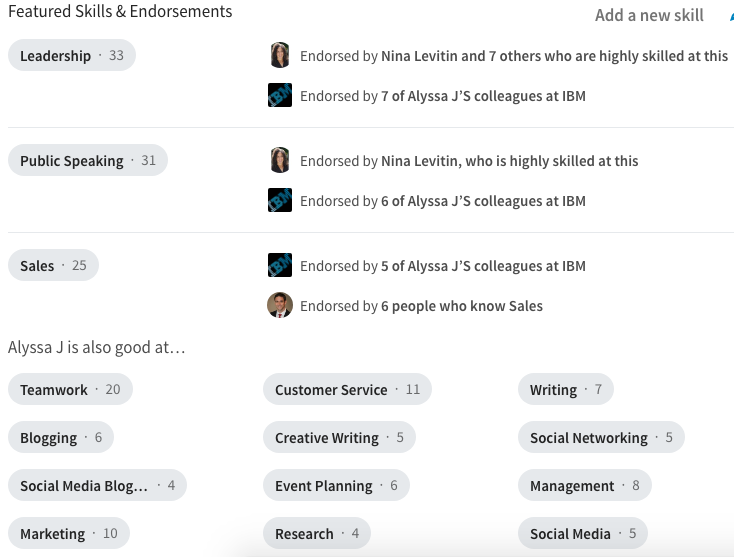 You can highlight particular skills that you are proud of to add to your profile and then others in your network can endorse you for those skills. If someone has worked with you and seen that you demonstrate leadership, for example, they can endorse you for the skill and if you haven't yet added it to your profile you can then do so. This section allows you to continue to tell a consistent career story about what you are an expert in, with confirmation from others that you do in fact bring these skills to the table. Aside from connections endorsing your skills, you can also ask for a personalized recommendation. This is great to do when you are finishing up an internship or have completed an impactful project. These recommendations add more credibility to your work and enable those viewing your profile to see that it's not just you saying that you do great work, but that other people have experienced it too! This area of your profile has quite a few facets, including Honors&Awards, Publications, Organizations, Projects, and more! You don't have to use every single subsection, but can fill out those that apply to what you have done. Generally, a long description is not necessary, just a sentence will do that people can see once they drill down in each section. This is the last section of your profile where you can follow certain brands, industries, and groups. Your main feed will be a combination of updates from your connections and articles based on your interests. Personalize your profile link. 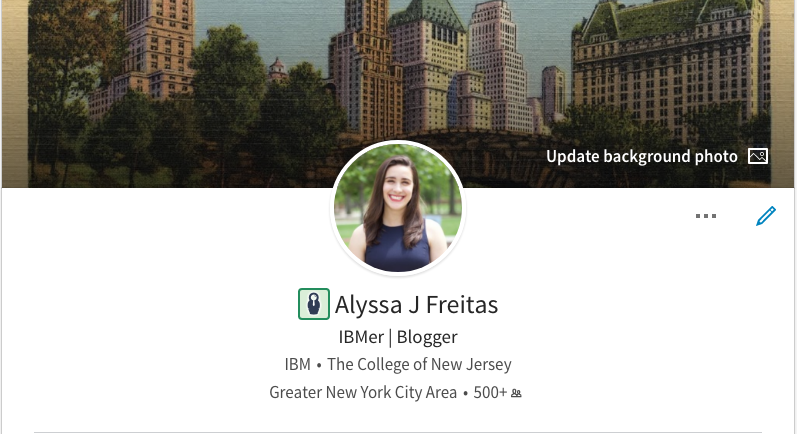 You may have noticed that my url is https://www.linkedin.com/in/alyssajfreitas/, with my full name. To personalize your link, go to Edit Your Public Profile on the top right, then go to Edit Public Profile URL. Be a secret agent. Unless you change your settings, people can see when you look at their profile and will get notified every time you make updates to your own profile. Not so great, right? To change this, go to Settings and Privacy under your Me tab. Go to Privacy, then change Sharing Profile Edits to No and make Profile Viewing Options change to Private Mode. In the next installment of this series we'll go over how to add connections (who you should add, how to reach out to people you don't know, etc). Check back next week for more! Do you love LinkedIn? What profile tips do you have?